A friend came over for dinner last night wearing a shirt with this beautiful crab embroidery on it...that was falling off because the manufacturer had only fused it on. The poor guy had lost portions of two limbs already and it looked like the rest of him would not survive the next wash. 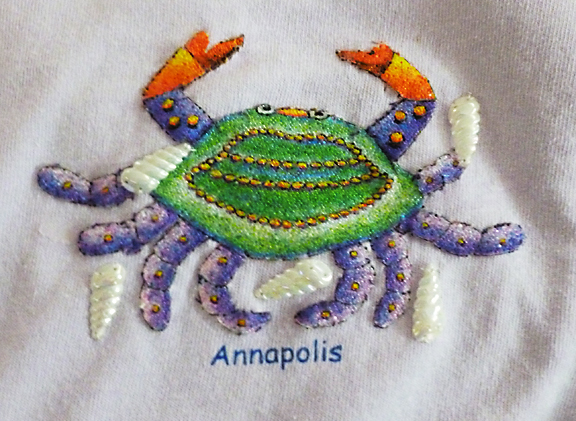 So I made her go home in one of my old shirts and did a quick rescue-stitch all around the crab. What to do about the missing bits? These shell-shaped sequins would cover them, and if I put a few extra shells on perhaps it would look like they were all part of the design, not patches. Then I started eyeing some lavender AB seed beads, but my Voice of Reason said, "Joanne would probably like her shirt back some time next year, and you haven't finished stitching the binding on that crib quilt yet and #1 Daughter, aka The Organizer, is 39 weeks pregnant." That Voice of Reason is a real party pooper sometimes.